Ironically, when I got the review list for this month, I asked if I could do Fleet Foxes and instead, I got Treefight for Sunlight – who want to be Fleet Foxes. That’s mean of me, I suppose – the truth is that both of them want to be the Beach Boys. 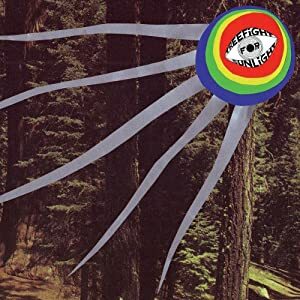 What really sparked the second comparison is that Treefight for Sunlight’s eponymous album is a collection of the most summery music I have heard for a long time, rarely venturing in to minor keys and with lyrics laden with references to sunshine, air and grass, apples, breeze and cherry trees. Like the Beach Boys too, Treefight for Sunlight are a band who experiment with arrangements and song structures and use a variety of interesting sounds to complement what is, when you get to the bottom of it, vocal-driven pop music. Throughout, it’s really musical, although in a restrained, not a virtuoso way. There’s a playful quirkiness that shines through and some good choices for additional instrumentation. There is a fair bit of piano work which is sometimes reminiscent of Penguin Café Orchestra (and Dustin O’Halloran, whose album I reviewed not long ago) as well as some of the more instrumental songs bringing to mind the soundtracks to Studio Ghibli films. The band are from Denmark, but sing entirely in English – a combination which often pans out strangely effective for Scandinavians – perhaps because you have to be so much more succinct when you have a limited vocabulary. Maybe for this reason, the lyrical themes are less epic, more down-to-earth and more personally-oriented than is common in the genre without being overly narrative or image-laden – like the soundtrack to an obscure mid-west American indie movie where nothing really happens. Much of the album sounds a lot like Camera Obscura sped up by about 5%, and has the massive reverbs and multi-layered vocals that marked Fleet Foxes album as something a bit special. Unfortunately, that’s the crux of it,for me – I would rate this album higher if it had been made five years ago, but although Treefight for Sunlight are treading ground broken forty years ago, before being by turned over by Fleet Foxes et al. it’s still well worth a listen.